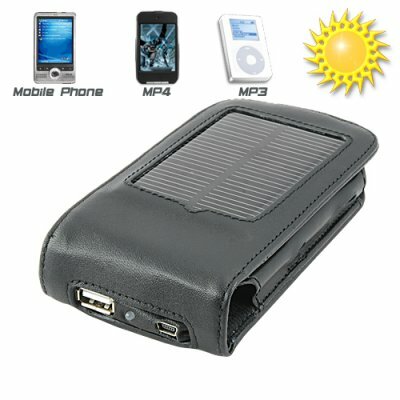 Successfully Added Solar Charger + Holder For MP3 MP4 Players and Cellphones to your Shopping Cart. Eco friendly solar charger and holder for cellphones and portable media players. This great solar gadget is the perfect outdoors charger for your portable electronic devices. Connecting it to your PC via USB cable. Collecting solar energy with the device's solar panel. Charging it with your computer while you're at work. Sticking it on your dashboard while you're driving. This fashionable model comes with a flip down cover, and on the inside there is a card slot where you can store your business cards or your bank card. The CVBT-S12 lets you charge anything that charges through USB, such as cell phones, MP3 and MP4 players, and even GPS devices! You will love the convenience of being able to charge all your electrical devices any time you want, anywhere you go. Everyday functionality, attractive design, and ease of use make this portable universal solar charger and holder great for consumers and resellers alike. Take advantage of Chinavasion's no minimum order quantity (M.O.Q.) policy to purchase a sample for yourself, then order in bulk for even better savings. From the leader in factory-direct high tech gadgets, Chinavasion. Eco friendly and stylish. Never run out of battery power ever again. You can charge devices that can charge through USB, such as cell phones, MP3 and MP4 players, and numerous other portable electronic gadgets.